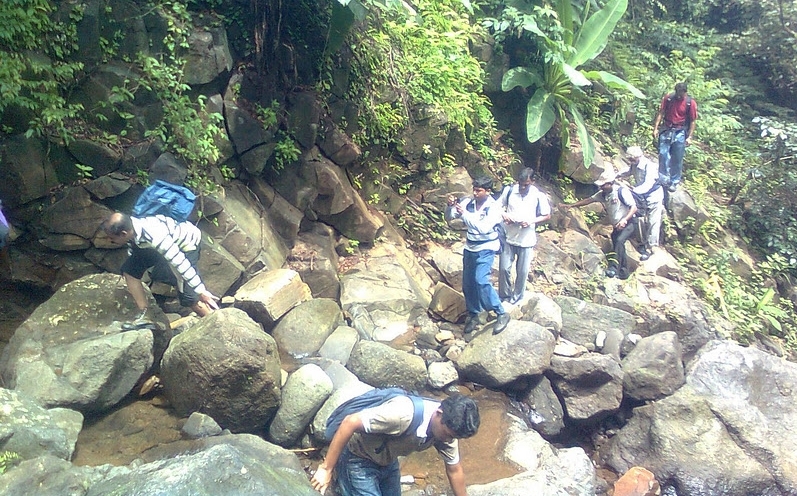 Chanderi (चांदेरी) trek was my second monsoon trek in my first year of Engineering. 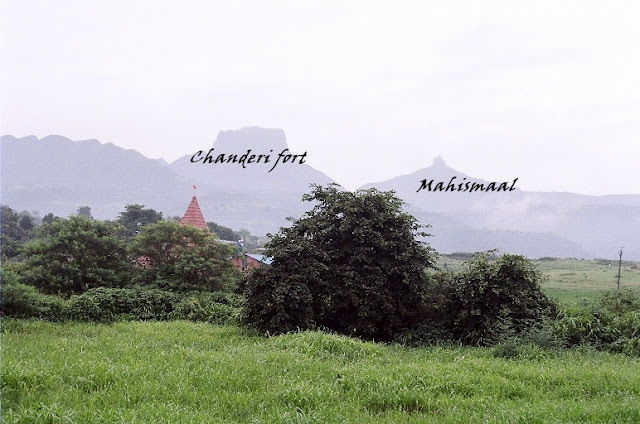 To reach Chanderi fort base village, we need to cover a long distance from Vangni station. Exit Vangani station from back side (towards CST side). Walk the small road from the station crossing that meets the Neral-Badlapur highway. 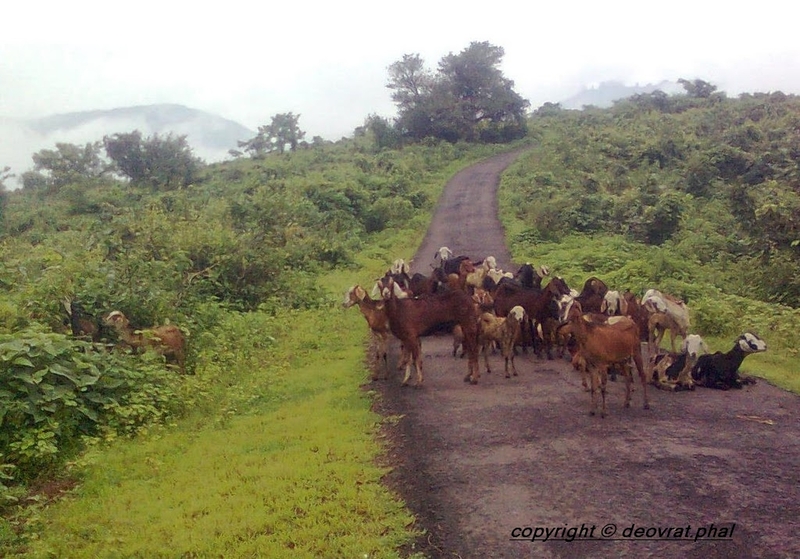 Take an auto to reach Kasgaon (कासगाव) junction in the direction of Kalyan/Badlapur. Kasgaon is roughly 5 km and will take 45 minutes by walking, or 10 minutes in an Auto/car. Take a left turn from the Kasgaon junction, to reach Chinchavali village. Kasgaon to Chinchavali is another 35 minutes walk (4 km) and 6/7 minutes by Auto/car. (Remember, I am writing in July 2011. Somethings might change, but the distances will remain same). So in short, the trek route follow via Chinchavli village, which is at a distance of about 7-8 km from Vangani station. We made our way from newly built farm-houses, empty plots, a small stream (it was almost a size of river) and tons of mud, and we arrived at a small school. That is the starting point of the trek. A short 20 min walk will take you to a plateau (looks more like a hunting ground) where you get an elegant view of Chanderi fort on the left and Mahismaal on the right. The col in the middle separates the two forts. This place was the first rest point for our group. 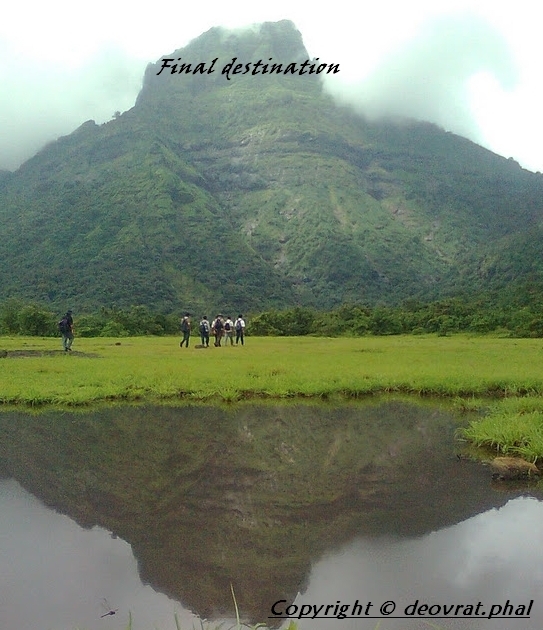 The real trekking adventure is yet to begin. 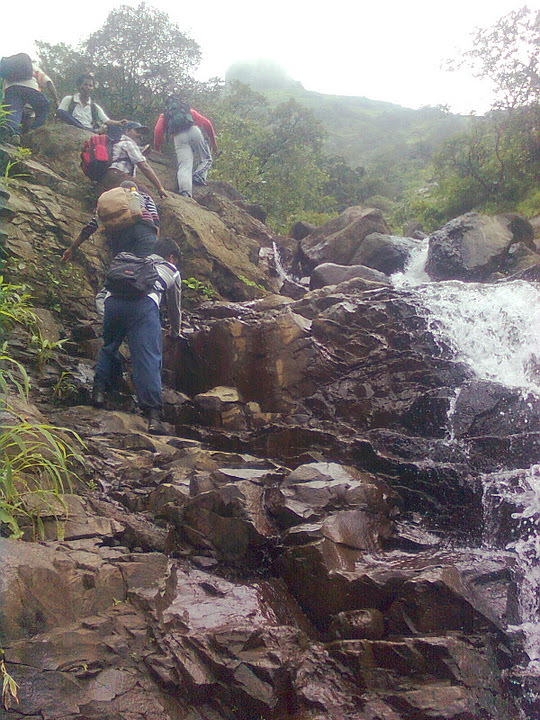 The trail follows through the hillocks and shrubs, right to the col. Chanderi is known for its getting lost in the jungle. Not finding the trail is kind of expected phenomenon. And if u take a wrong turn, you will either find yourself amidst huge boulders or into a water stream !! But no worries. This is how you become a mountaineer. There are many waterfalls (small to mid-sized) and the route is very slippery during rainy season. After the col, the route is filled with scree. Many local organizations have tried to mark the route but some or the other marker can be seen missing. The best way would be to ask a villager to follow you. Atleast you wont waste time searching for right route. Tip: If you think you are lost, then search for arrow marks on the boulders or the tree trunks. There are also saffron bands or some markings on the trees (not always) that can be helpful. After all this tedious but equally refreshing journey, we finally reached the top. Once you see the cave, stop there. That is the maximum limit you can go (atleast during the monsoon). This cave lies below a huge square massif. There is an old idol kept inside the cave. But we were so famished that we decided to have our lunch first आधी पोटोबा, मग विठोबा. There isn't much for sightseeing at the top. But if lucky, and with good visibility, you can get a magnificent view of Peb, Matheran, Prabalgad, Irshalgad in Panvel region. 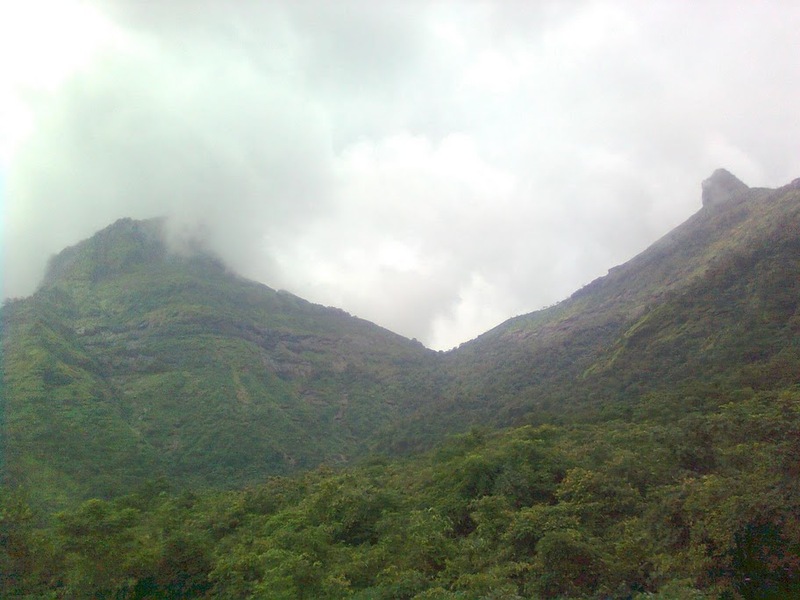 With even better visibility, Gorakhgad, Siddhagad and Bhimashankar can be seen. Avoid going beyond the huge rocks n boulders as its very risky during monsoons. The 300 ft. pinnacle is one of the favourite rockclimbing destination for many climbers. Top of the fort can be reached from the back. We didn't climb the pinnacle as it was slippery. People visit Chanderi throughout the year. A small statue of Ch. Shivaji Maharaj can be seen at the top. The descend wasn't that tough, but the route was a bit slippery because of the rains. The waterfalls couldn't be missed. We reached the village @ 7.00 pm. where we met a guy who turned out to be a milk-van driver, and we got a free lift to Vangni station. 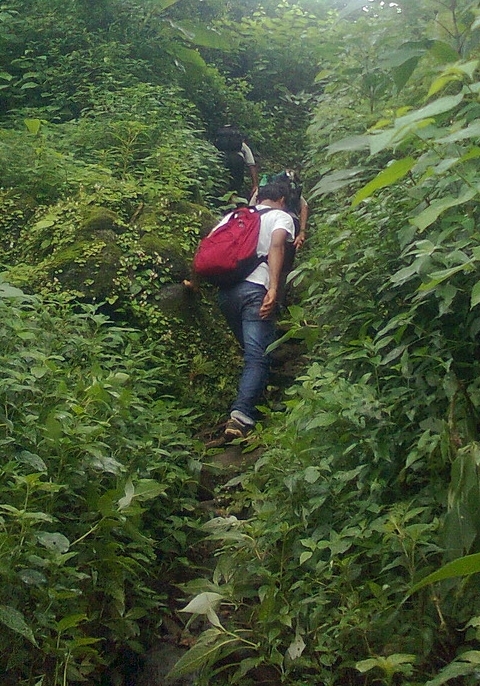 All-in-all, Chanderi trek turned out to be one of my adventurous 1-Day trek. Had been there with my father (Dilip Phal) and his friends. Height of Chanderi fort is 2330 ft. Chanderi fort is considered a tough fort (not as tough as Alang-Madan-Kulang). Accidents due to stones falling from the top are quite known here. Always be alert when near waterfalls as the water tends to move a lot of stones along the way. Remainants of 'fort' can be seen in form of broken wall (तटबंदी). Otherwise, the view from the top is, as always, amazing!